MACBOOK PRO WITH DUAL 24″ APPLE CINEMA DISPLAYS! Finally put the second Apple Cinema Display to use after months of waiting for the module and adapters to come in. Matrox just came out with a graphics module (dualhead2go DP Edition) that allows the Macbooks to run two monitors with a total maximum resolution of 3840×1200 (2×1920x1200). Theo Vavas on MACBOOK PRO WITH DUAL 24″ APPLE CINEMA DISPLAYS! 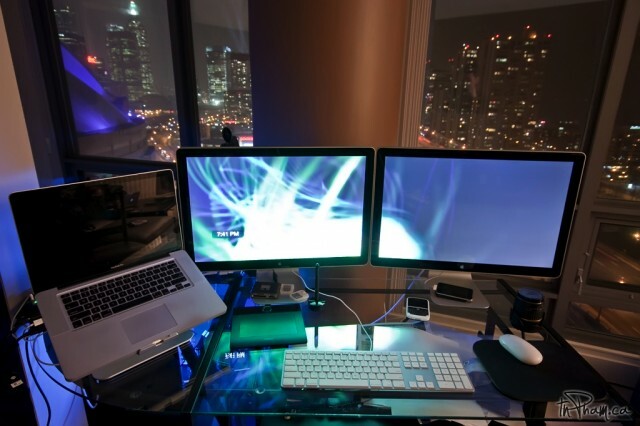 Jeff Pannell on MACBOOK PRO WITH DUAL 24″ APPLE CINEMA DISPLAYS! John on MACBOOK PRO WITH DUAL 24″ APPLE CINEMA DISPLAYS! Morgan on MACBOOK PRO WITH DUAL 24″ APPLE CINEMA DISPLAYS! Rex on MACBOOK PRO WITH DUAL 24″ APPLE CINEMA DISPLAYS!